Invitation to the visit of Her Majesty Queen Elizabeth II to mark the final stage of electrifying the railway from London to Edinburgh and the introduction of Intercity 225 trains. Kings Cross Station, 28 June 1991. Invitation 'to a special fast run of Intercity 225 on Intercity West Coast from Manchester to London Euston on Thursday 30 April 1992. This historic occasion is in support of Manchester's Olympic Games bid and demonstrates Intercity's commitment to the North West'. Invitation 'to a special fast run of Intercity 225 on Intercity West Coast from London Euston to Birmingham on Thursday 30 April 1992. This historic occasion demonstrates Intercity's commitment to the West Midlands'. Invitation to the naming ceremony of an Intercity Class 91 locomotive "The Royal Air Force Regiment", on platform 8, London Kings Cross Station, 27 February 1992. Invitation, to the Royal Station Hotel, Hull for the visit of the Queen and Prince Phillip, 18th May 1957. Invitation, The Chemins de fer Britanniques (southern, LMS, GW and LNE Railways of ENgland) request the pleasure of (blank) on Tuesday April 16th 1946 at 12 noon to mark the reopening of their Paris office at 12 Boulevard de la Madeleine, unused. Two invitations to the Opening of The Hull Joint Dock, t by North Eastern and Hull and Barnsley Railway, by George V, Friday 26 June 1914, (Other IDs 77/43/22). Invitation card, Mersey Railway, To the opening of an extension, 9 January 1892, Printed 31 December 1891, (Other IDs 76/25/458). Invitation, Lancaster & Carlisle Railway, to T.H. 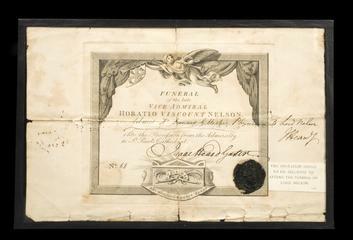 Carr opening of the line, 15 December 1846, (Other IDs 76/25/416). Invitation to E.F. Wilkinson, from the North Eastern Railway Company, to attend the opening of the New Bridge over the River Wear by the Right Honourable The Earl of Durham K. G. Thursday June 10th, 1909. Issue by the NER and the Corporation of Sunderland. Invitation, to the Annual Staff Dance at for the Zetland Hotel, Saltburn-by-the-Sea, 1953. The Tyne Improvement Commissioners invitation to E. F. Wilkinson, to attend the opening of their New Riverside Quay at Albert Edward Dock on Friday 15th June, 1928. Invitation, card, five copies, "Commemoration of the Railway Centenary", for the exhibition at the Wagon Works from the Chairman and Directors of the London and North Eastern Railway by the Chairman and Directors of the London and North Eastern Railway to be held at Faverdale. Invitation, card, "Commemoration of the Railway Centenary", held by the chairman and directors of the London and North Eastern railway Company at Stockton and Darlington on Thursday the 2nd July, 1925. Invitation Card to Sir Henry Robinson and Lady Robinson, by Mr W S Simpson, to Dinner at Norwich on the occasion of turning the first sod of the East Norfolk Railway, replies to Secretary of the Great Eastern Railway Company, 18 Oct 1865. 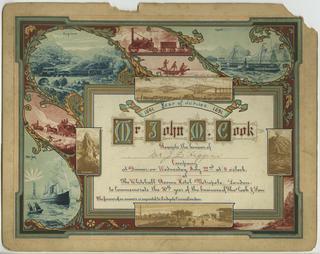 Invitation card by The East Coast Railway Companies (The Great Northern Railway, North Eastern Railway, and North British Railway) for the first trip of the East Coast Corridor Dining Train from London Kings Cross to Edinburgh, 15 Jul 1893.
invitation, The Southern Railway, To the opening of new line, Motspur Park to Malden Manor and Tolworth, 25 May 1938. (Other IDs 76/25/88 - 2447/58). Invitation, British Railways Southern Region, to view the new cross-Channel ferry, Lord Warden, at Dover, Monday 16 June 1952. Programme on rear. (Other IDs 76/25/76 - 400/1/58). Invitation, British Railways Southern Region, request the pleasure of the Company of to view the new cross-Channel Car Ferry, Lord Warden, At Dover, Monday 16 June 1952. Cream card printed in green with programme of events on rear. (Other IDs 76/25/77 - 400/2/58). Invitation, Caledonian Hotel Edinburgh. Inviting guest to celebrate the 80th anniversary of the hotel and comletion of the total refurbishment programme. October 11th, 1983. Invitation card to the official opening by HRH The Prince of Wales, of the Forth Bridge and luncheon at South Queensferry, issued by the Directors of the Forth Bridge Railway Company, with itinerary and plan of area and company seal. With map of the area on the reverse. 4th March, 1890. Invitation, in French reading Mr. John Elliot president les membres du railway executive prient ... de les honorer de as presence au dejeuner au Grand Hotel Eastbourne le mecredi 6 juin 1951. Invitation, Liverpool & Manchester Railway, To the opening of the Liverpool & Manchester Railway, 15 September 1830, (Other IDs 76/25/396). Invitation, card, North Eastern Railway, "Unveiling of North Eastern Railway War Memorial, York 14th June 1924", 125mm x 185mm. Invitation card to the official opening of Darras Hall Station, an Extension of Ponteland Railway, North Eastern Railway, by the Rt Hon The lord Mayor of Newcastle Upon Tyne, 1913. Invitation card to the official opening of Darras Hall Station, an Extension of Ponteland Railway, North Eastern Railway, by the Rt Hon The lord Mayor of Newcastle Upon Tyne on the 27th September 1913. Invitation, card, four copies,"Commemoration of the Railway Centenary", from the Chairman and Directors of the London and North Eastern Railway by the Chairman and Directors of the London and North Eastern Railway for the opening of the historical railway exhibition to be held at the Faverdale Wagon Works, 1st July 1925. Invitation card from the chairman and directors of Swan, Hunter and Wigham Richardson Ltd to Sir Charles Scotter for the launch of Cunard S.S. Maurentania on Thursday September 20th 1906 at 3:30pm. With colour drawing of the vessel. Dinner Menu, London & North Eastern Railway, Complimentary Dinner and Presentation to Sir Charles Henry Newton, Chief General Manager, to honour his Knighthood, Thursday, 29th July, 1943, printed on card. Invitation, The Southern Railway, at the inauguration of their new Isle of Wight Steamer P.S. Ryde on Thursday, 1st July, 1937. Cream card printed in green with programme on rear. (Other IDs 76/25/89 - 2448/58). Invitation card to the inaugural sailing of the new ferry m.v. Freshwater from Lymington Pier to Yarmouth IOW, issued by the Southern Region of British Railways, 21 September 1959. REply to F.D.Y. Faulkner, PR and Publicity Officer of the BR southern region. South Eastern Railway invitation 'Trial trip of S.S. Albert Victor from Folkestone to Boulogne and back'. Dated Tuesday 6th July 1880. With train arrangements. Unused. Invitation, North Eastern Railway/Hull & Barnsley Railway, To J.A.F Aspinall, Opening of Hull Joint Dock, 26 June 1914, (Other IDs 76/25/415). Invitation, Opening of The Hull Joint Dock, to Mr. & Mrs. R. Pawley by North Eastern and Hull and Barnsley Railway, by George V, Friday 26 June 1914, (Other IDs 77/43/22). Invitation, three copies, card, "Commemoration of the Railway Centenary", to view a procession of rolling stock, held by the chairman and directors of the London and North Eastern railway Company,with burgundy coat of arms as a header and information on the ceremonies on the inside sheets, at Stockton and Darlington on Thursday the 2nd July, 1925. Invitation, card, "Commemoration of the Railway Centenary", held by the chairman and directors of the London and North Eastern railway Company,with gold coat of arms as a header and information on the ceremonies on the inside sheets, at Stockton and Darlington on Thursday the 2nd July, 1925. Invitation, to the Annual Staff Dance at the Royal Station Hotel, Newcastle, 1957. Invitation to the Annual Staff Dance at the Royal Station Hotel, Newcastle, 1957. Invitation, invite and letter to Mr Dow, to the opening of the Regent Hotel, London, (previously the Hotel Great Central), 8th July 1993. Invitation, Great North of England Railway, From directors to directors of of North Midland Railway, To dinner celebrating the opening of G.N.E.R., 18 March 1841, (Other IDs 76/25/397). Invitation, Royal Station Hotel, York, from Mr and Mrs W. H. Brown to the 21st birthday of their daughter, 16th December, 1938.